Two of Irena’s poems, “Foundation” and “The Linoleum,” can be read in Rods and Koans and in Issue 1 of Superstition Review. Join us in the annual celebration Thursday April 21, 2016 from 6-8 p.m. in the Heritage Room in the University Club (ASU Tempe Campus). Among the oldest and most celebratory traditions in the Department of English–this year will be the 54th year–is the evening we gather to honor student creative writers from across the ASU campuses at the Annual Swarthout Awards. There will be a pre-reading reception to welcome friends of Miles Swarthout, who recently passed away. Before the Awards, a brief tribute to Miles will be offered by Stacie Anfinson. 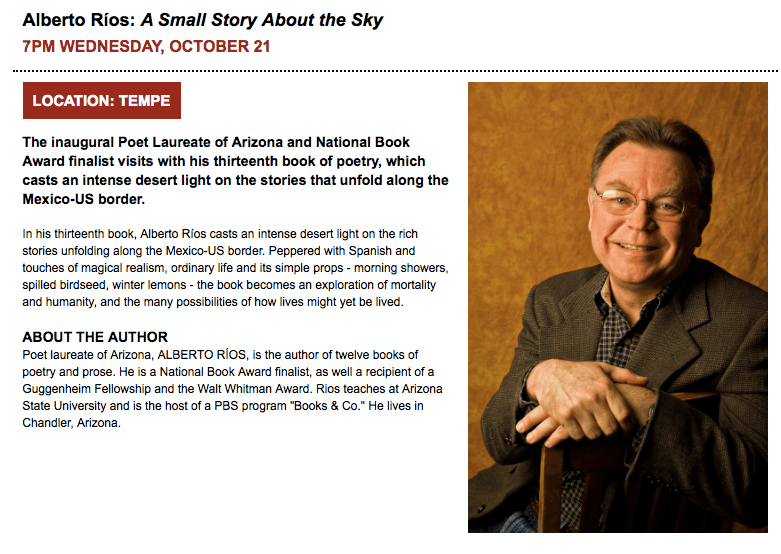 Arizona Poet Laureate Alberto Rios will serve as inimitable emcee. This event is free and open to the public. Even Though the Whole World is Burning is an intimate documentary portrait of the extraordinary life of acclaimed poet and ecologist W.S. Merwin. 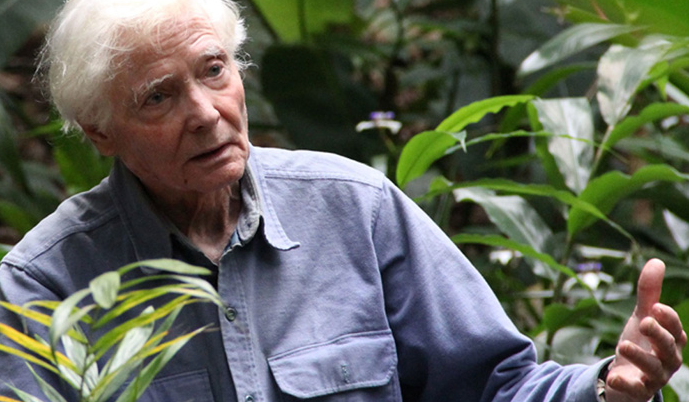 This feature-length film from independent filmmaker Stefan Schaefer chronicles Merwin’s significant place as a leading figure in American poetry and highlights connections between Merwin’s environmental advocacy, his daily horticulture practice and his writing life. In a career spanning nearly six decades and more than 60 books, Merwin’s poetry and translations have won nearly every major award available to poets, including two Pulitzer Prizes. For the last thirty years this former U.S. Poet Laureate has made his home on Maui, surrounded by acres of land once devastated from years of erosion, logging and toxic agricultural practices. Following a daily gardening practice, Merwin has painstakingly restored the property to a lush palm-filled landscape that is now recognized as one of the most comprehensive palm forests in the world. A short panel response and reception featuring Susan Norton, Paul Hirt and Alberto Ríos will follow the screening. To get tickets, please go to their LEARN site. Tickets include admission into the Garden, so you can also stroll through and enjoy the incredible Bruce Munro exhibit before or after the film. This event is not included with Garden membership. 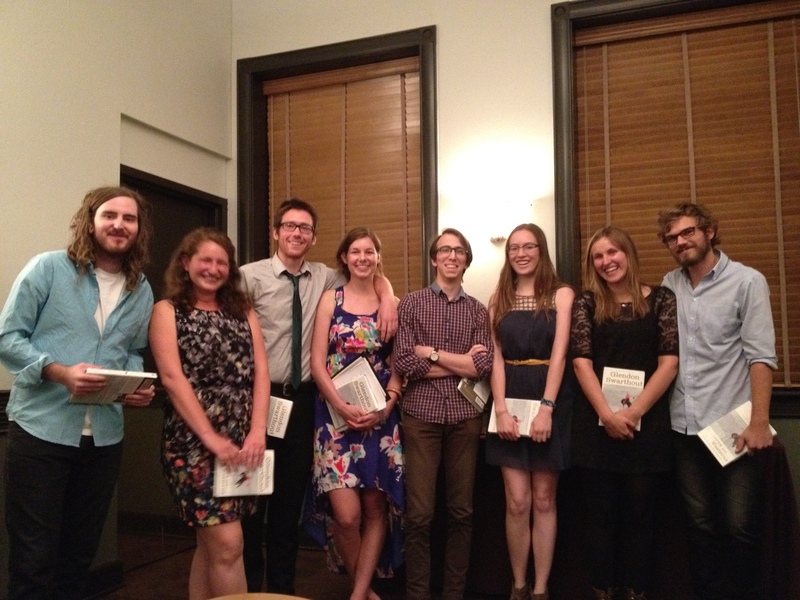 Poetry Center Walt Whitman Circle Members enjoy membership pricing (code “PoetryAZ”). The Waste Management Open (still referred to as the Phoenix Open by most people) is not about golf. The people I talked to never talked about golf, except for one couple who wondered if anybody famous was playing. The day I went was the day of the Pro Am and it was Emmet Smith and Randy Johnson and some other non pro-golfers playing. I guess Bill Murray had played there once before and someone told me that Tiger Woods never plays the Open anymore because he had been heckled by an onlooker, someone yelling racial slurs. The day before I was at the open two people were kicked out for spitting on a member of the National Guard. People trade passes to get into exclusive blocked off parties. Each party is at or near a certain hole. Everyone wants the 16th hole. The wildest hole in golf where drunks toss things at the course, where people throw punches, do body shots, dance on tables and everyone, everyone, wants at least one more round. People moan about the loss of the infamous caddie races, about how hard it is now to get tickets to the Bird’s Nest, the night club which opens early evening and closes after three a.m. There were four thousand DUIs last year as a result of the drinking at the Phoenix Open. It isn’t all bad. 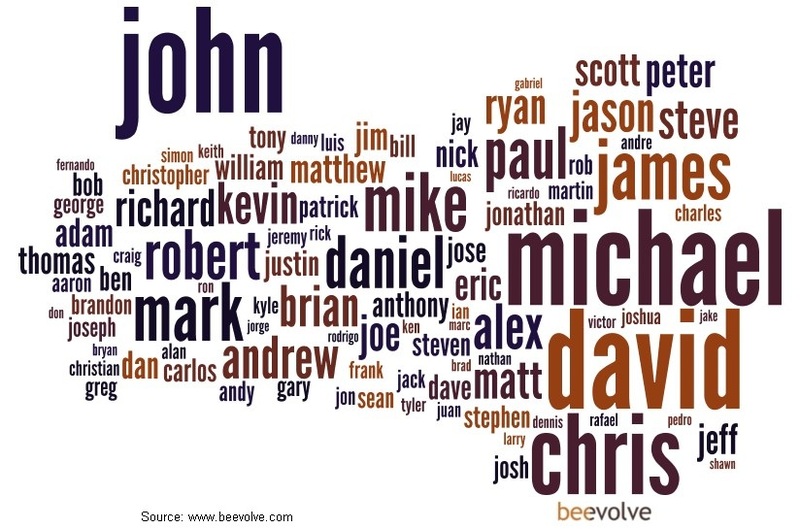 This is just the logical end result of what happens when thousands of people meet in one area and drink and interact. 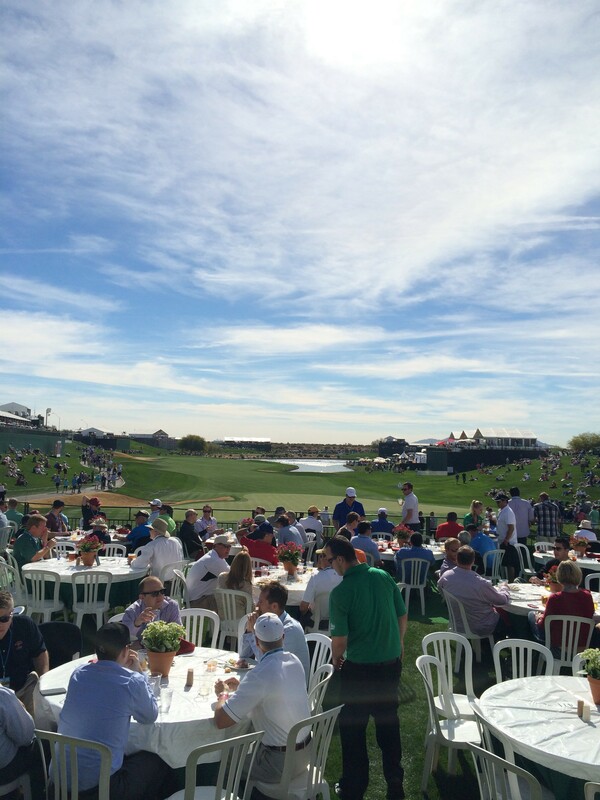 This was my first time at the Phoenix Open, and it made me think of other events I’ve attended. I thought of how I saw Kanye West at U.S. Airways, or how I celebrated the 4th of July at Chase Field, or the time I spoke broken German through the city of Munich on its Birthday Party years ago during my Summer vacation. Then I remembered the first time I won an Award for Creative Writing. I placed third in a community college competition. I still won a decent amount of money for bronze. The Awards Ceremony took place in a large room at the top of the library. The people in the audience as I read my poem were made up of the judges, of creative writing faculty, of creative writing students who were interested and those were in desperate need of extra credit. After I read, no one talked really but golf clapped as I walked back to my seat. It was a standard reading, which isn’t a good thing. For after-ceremony snacks, they served brownies and lemonade. I have been to a few other literary events after that one. Usually I dread going to a reading, especially if it is an author whose work I love, because I often don’t like the actual voice of the author compared to the voice I had created in my mind. I had seen two married poets read in that same library room at the college, a year or so later. I placed in the same Award contest again, this time coming out on first in two categories. I remembered to bring Tupperware with me, to take home the left over brownies. I had gone to Changing Hands before, too. I saw Benjamin Hale read from his first novel The Evolution of Bruno Littlemore. It was the first reading I really enjoyed, because the author was more of an actor than a reader. It was one of those readings where you just wanted to start talking to the writer, where you just wanted to go up to him and ask him anything. I was once at a coffee shop on its Open Poetry Mic Night and drank my espresso, my poems pulled up on my phone, waiting for someone to go up to the mic and read first. No one did and I went home before finishing my drink. At the Open my first drink was a gin and tonic and my brother got a beer. It was just about to hit 11:30. “You have somewhere you have to be today?” he asked. “I don’t know. A poet, I guess” I said. It was the Alberto Rios reading at Changing Hands Bookstore. 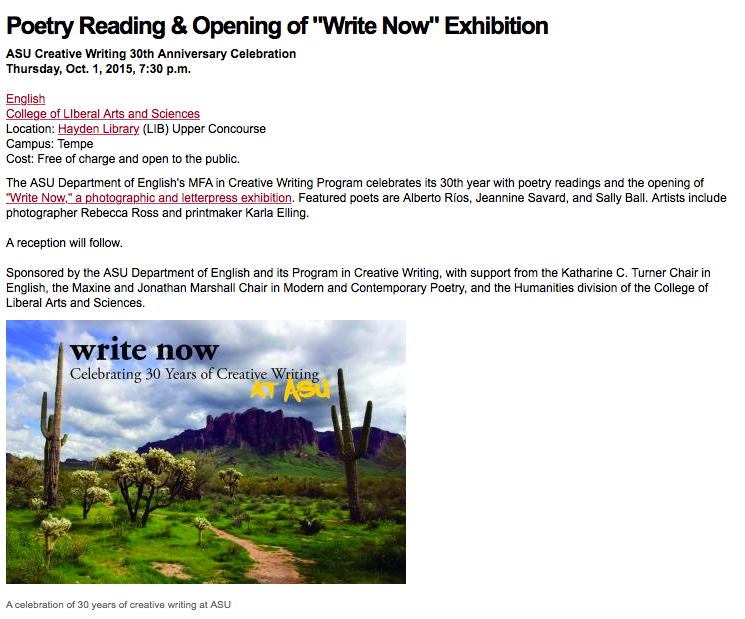 I didn’t know at the time that he had been named Arizona’s first Poet Laureate and that this was a small celebration in his honor. The poetry of Alberto Rios is literal. Not so much the kind of poetry I was used to reading, where a tree becomes a metaphor for the way your father used to beat you. It was more a Garrison Keillor-like story told with funny formatting but without the Lutherans. It is dipped in politics and accompanied by the voice of someone who is not impressed with tricks or gimmicks. His poetry was enjoyable, and his conversations with the audience were fantastic. A really great reading, I think, is one where you almost want to tell the poet to close his book and come down and join the crowd. It isn’t that the golf at the Phoenix Open, like the reading at Changing Hands, doesn’t matter. It is golf that got people to show up, but something more was needed to make people stay. The poetry needs to be there, in all its incarnations, between and around the people as they move closer and closer together. The poetry was there at Changing Hands, too, even after he finished and looked up at the small audience and smiled. As strange as their juxtaposition was, I’m glad I got to experience two, if very different, rich Arizona traditions. The Superstition Review staff continues to gain momentum while working on Issue 6. Section editors are voting on submissions via our website, Submishmash, which has allowed advisors and editors to work quickly, reading submissions then assigning them to additional readers. As a reminder, the Superstition Review submission period concludes on October 31st and submissions can be made to http://superstitionreview.submishmash.com/submit. Our Interview Editors have confirmed several interviewees for Issue 6 including Beverly Donofrio, Elizabeth Kadetsky, Alberto Ríos, Rishma Dunlop, and Erick Setiawan. Interview Editor Kimberly Singleton was delighted by positive feedback from Erick Setiawan about the Superstition Review website. He stated, “great website, by the way, and very much needed.” These interviews will take place in the next few weeks and will appear in Issue 6 of Superstition Review. Additionally, Reading Series Coordinator Mary Richardson is pleased to announce that the Melissa Pritchard reading has been scheduled for November 18th. Pritchard is the recipient of numerous awards, including fellowships from the National Endowment for the Arts, the Howard Foundation at Brown University, the Illinois Arts Council. More details about the reading will be announced soon.